Grabowski, B. & Flick, B., (2009) Printmaking: A Complete Guide to Materials and processes, London, Lawrence King Publishing. Hartill, B. & Clarke, R., (2005) Collagraphs and mixed media printmaking, London, A&C Black. intaglio: inking the lower parts of the plate using a poupee and drypoint techniques, burnishing the relief. The relief parts of the plate can also be incised and drawn into with different tools. combination: using different textures, tones or colours. This often also takes advantages of differences in viscosity of ink that can be obtained through using different amounts of extender. Many layers can be superimposed using registration techniques. Plates can be cut. Masks and chine colle can be added. The plate can be made from any sturdy materials, cut to any size. Or different size plates can be combined as long as allowance is made for some degree of embossing around the plate. Sometimes it may be necessary to seal the plate before gluing on objects. Any low relief materials can be glued onto the plate. Collagraphs can pick up fine detail so it is not necessary to have high relief. Thin materials like tissue or glassene paper print very well and these can transfer surface texture and shape when printing. Different surfaces absorb in different ways and these differences can be exploited to the full. Smooth surfaces can be burnished to remove ink and give subtle tones. Shapes and images can be implied through creative use of contrasting textures and surfaces, creating complex narratives. Simple bold arrangements of shapes and textures also work well – abstract qualities creating a surface of great interest and visual effects. plant materials will last longer if the leaves etc are dried out and no longer contain moisture. carborundim grit mixed with glue can give a dense mark. glue, acrylic gesso and tile adhesives and even thick impasto acrylic paint can be used and sculpted or drawn into on the plate in low relief. the surface of the plate can be cut or scored into as long as the marks are not too deep from the top parts of the print. no one material should stand too proud or it will stop the area around it from printing. Try not to use anything thicker than a piece of mountboard to give a good even printing across the plate. Do not use anything sharp or it can cut the blankets on the press. When the glue has dried thoroughly, give 2 coats of varnish or shellac to stop paper sticking to the plate and enable it to be cleaned. Careful inking can produce very delicate and varied texturing and tonal effects using the different plate textures and edges, as in the series of mushroom collagraphs below. Before inking for the first time, to help the plate separate from the paper, rub a small quantity of oil into the surface with cotton wool. Because different materials hold onto ink in different ways, it is useful to mix etching ink with plate oil or extender to loosen the ink, making it easier to wipe and thin the saturated ink colour. 50/50 is good to start with and can then be adjusted after proofing. Different materials will require different proportions and each plate is unique. Different inks and percentages will also give different effects. brushes of different types and sizes can paint and texture the plate much as with monoprint. rollers – soft rollers will push ink further into the plate. If you want to just cover the highest parts use a hard roller. Small rollers can get ink into different areas of colour. Big rollers give a consistent sweep. dollies made up of rolled J-cloths bound with masking tape. wipe off/burnish areas with tissue paper, newspaper, scrim or j-cloths give different effects. fingers protected by latex gloves can also be used for painterly effects. After inking solvents and other texturing media can be used. Lines can also be drawn into the ink and the ink can be smeared and mixed. Paper can be of varying types depending on the effect required eg the relative importance and amount of detail of relief and intaglio, extent of embossing and inking techniques used. 250-300 gms printing or watercolour paper is best used damp. This is good for embossing techniques and smearing marks as in Untitled Red 4 and Untitled Cyan 4. Hosho paper works well but do not dampen it – though a dampened cloth can be used next to the paper to activate the ink. The mushroom series above used thin Hosho paper for high detail and delicacy. Untitled Brown uses thick hosho for more embossed and texturing/markmaking in the ink. thinner paper can be used, including tissue paper or newsprint if more vague images are required. for intaglio use damp paper or a damp cloth next to the paper to activate the ink. for relief dry or damp. It is quite difficult to get good handpulled collagraph prints if intaglio is important as the paper will not go down into the incised marks. Best results are obtained with an etching press. Experiment with different amounts and types of packing paper. The thicker and softer the packing eg blotting paper, the more it will push the print into the recesses of the plate – and the quicker the plate will flatten and potentially degrade. You can also reverse the blankets to put the softer blanket next to the paper. Putting the paper on top of the plate pushes down for intaglio. Putting the plate on top of the paper gives a clear relief. Use cooking oil but this will always leave an (often interesting) shadow. Different effects can be built up in this way. Choose your subject can be chosen from any figurative source, a sketch, painting or photograph but it must have a good underlying compositional structure. Look at your subject. In your learning log write down why you chose it and what attracts you to it. This is important information to establish as it may help you when you come to abstract your design from your subject. You may have been drawn to the colours, or the shapes or the formal arrangement of elements. Simplify the formal geometry of the image you have chosen so that the proportions and way the shapes interlock are based on the original image. work through a formal process gradually simplifying a theme until you reach a balance of geometric shapes and proportions. You will have to make several studies until you are happy with the final arrangement. Once the geometric shapes have been organised and put together they can be transferred to the card used for the relief collotype block. Each shape should be cut out with as much accuracy as possible so that they will perfectly fit together. When you have cut out enough pieces begin to construct your block. Starting with the base glue your shapes down using a thin, even layer of glue such as PVA wood glue. Continue to build up your block keeping each shape at a different level. Don’t use more than four layers as the block will be too deep and there is the risk of the paper tearing when you print from it. When you have finished, sandwich the block between two sheets of blotting paper and some newspaper, place a heavy weight on top and leave it on a hard surface overnight or until dry. It is important the block dries as evenly and flat as possible so don’t be tempted to take it out of the paper until it is totally dry. Once it is dry, coat the bottom and edges with shellac varnish (or similar waterproof varnish). Leave to dry and then varnish the top surface. If the card absorbs the varnish repeat the process until all the surfaces are fully coated with a hard layer of varnish. I printed out the final image on A4 paper and stuck it to 3 pieces of back card. And cut out 3 versions on different thicknesses of card. From these pieces I then made 3 alternate plates with different proportions of card on different parts of the image, sticking these onto the backplate paper with PVA glue. I used 3 coast of diamond hard varnish, and pressed the 3 plates for a couple of days. way through but not soaking wet on the outside. Several sheets of paper can be prepared at once and sandwiched between blotting paper in readiness for your printing. If they dry out you will need to repeat the soaking process. I used Bockingford following the above instructions. But actually found that Japanese Hosho paper with a damp J-cloth on the back also got a good emboss. Once your relief collotype block is dry you are ready to ink it up. You can use water or oil based block printing ink. The oil based ink will give you a longer working time as it will dry much slower than water-based ink. Water-based ink, on the other hand doesn’t need solvents to clean it up, but will dry fairly fast. Using an old toothbrush apply the printing ink in small smooth strokes to cover your block. Alternatively you might like to add the ink with a dabber. When the block is covered in ink you can wipe away some of the colour to vary its intensity in places and reveal some of the varnished areas. Wiping the ink away will allow the block surface to emboss the paper without printing any colour. I used Hawthorne oil-based inks, sometimes with transparent medium. And used toothbrush, small roller and poupee to get different effects. Some of the ink was quite stiff as it had been left for a while. Experimenting with different viscosities, overlaying smooth ink with thinker ink on a roller, and making brushmarks achieved some quite interesting effects. But it was sometimes difficult to predict exactly how they would print, depending also on the printing pressure and dampness of the paper. You can take your print in one impression as all your colours have been applied to the block. As you are aiming to get the colours of your design printed with an embossed impression of the block as well you will need to apply a strong, firm pressure from a soft roller. If you have a small, flat bed press you can use that. Place your inked relief collotype block ink side up on a sheet of blotting paper and lay your dampened printing paper over the top. On this, place another sheet of blotting paper. Secure the corners of the blotting paper to your table top with masking tape to reduce the risk of the papers slipping. Using a firm pressure by putting your weight behind the covered rolling pin roll it across the paper. You will need to achieve this in one go. Alternatively you may hand emboss the print through a clean towel to avoid tearing the paper. The damp paper is forced onto your relief block and will pick up the ink as well as be pushed into the relief of your block. Once rolled, remove the tape from the blotting paper and lift your print. It should be stored flat between two sheets of blotting paper but not weighted as this will flatten your relief. On an etching press I did not need tape. But I found it necessary to swap around the blankets on my etching press to put the soft blanket at the bottom to get the best emboss. Clean your relief block and carefully dry it. You may repeat your printing process in the same colours or try a new colour scheme. In each case make the printed surface as perfect as you can taking into account the texture of the paper you are using, the quality of the ink and the effect of the relief collage block. I made several prints just re-inking the plate. I really like the way the different ink colours and textures mix, and the coloured lines from left-over ink. D’arcy Hughes, A. & Vernon-Morris, H., (2008) The Printmaking Bible: the complete guide to materials and techniques, San Francisco: Chronicle Books. Grabowski, B. & Flick, B., (2009) Printmaking: A Complete Guide to Materials and processes, London: Lawrence King Publishing. Hartill, B. & Clarke, R., (2005) Collagraphs and mixed media printmaking, London: A&C Black. Major-George, K., (2011) Collagraph: a journey through texture, UK: Major Impact. Martin, J., (1993) The Encyclopedia of Printmaking Techniques, London: Quarto Publishing. Stobart, J., (2001) Printmaking for Beginners, London: A&C Black. Woods, L., (2011) The Printmaking Handbook: Simple techniques and step-be-step projects, London: Search Press. There is no exact date for the beginnings of collagraph printing. 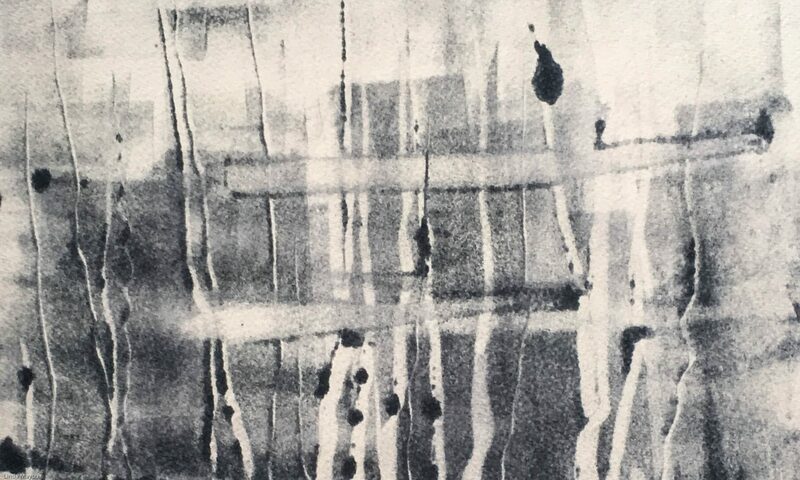 It evolved alongside other intaglio and relief printing, particularly with the move towards abstraction, introduction of ‘found’ materials and use of collage and mixed media in 1950s and 1960s. It was also helped by the widespread availability of new, cheap materials like acrylics and very strong adhesives. Pierre Roche – sculptor developed gypsographic printing using bas-relief plaster engraving – inked in relief and printed by hand onto dampened paper, leaving a slightly raised blind embossing. Later he added layers of an adhesive called gypsum onto metal plate for an embossed effect. Bauhaus: Klee, Picasso, Braque, Schwitters and Moholy-Nagy used collage materials and this was adopted by printmakers. Rolf Nesch: one of the first artists to have consciously used collage to create collagraph printing plates. He gave depth and texture to prints by soldering out metal shapes and wire to metal printing plates. He then took this further by drilling holes in plates and sewing to the base plate. The prints were so deep he hneeded 8 blankets to get the right pressure and very heavy strong paper. For more details on the work of Rolf Nesch, click here. William Hayter developed viscosity printing – a technique that allowed a single printing plate to be printed in many colours. The basic principle is that the viscosity or stickiness of an ink can be reduced by adding linseed oil. A stiff viscous ink will absorb and mix with an oily ink laid over the top. But if an ink full of oil is placed on the plate first, it will reject a dry viscous ink and will not mix with it. Richard Hamilton mixed painting with forms of printmaking, such as collotype, lithograph and silkscreen. Joan Miro created numerous collagraphs combining carborundum, aquatint and etching. Brenda Hartill has been very influential in UK, building on Hayter’s techniques of viscosity printing. Martin, J., (1993) The Encyclopedia of Printmaking Techniques,London: Quarto Publishing. O’Donoghue was born in England but lived and worked for many years in County Kerry, Ireland. He graduated from Goldsmiths in 1982 and was Artist in Residence at the National Gallery, London from 1984-85. His work is characterised by an engagement with the past. He uses figuration and abstraction to explore themes of human identity, memory, remembering and experience; and draws on history, mythology and personal records to create works which resonate with emotional intensity. His printmaking includes very large carborundum plates of figures. He mixes fine grain carborundum, acrylic paste and black acrylic paint. He paints this on the plate with a thick brush, wiping off and reworking the image on the plate before it dries. This makes a complex, multi-layered texture. He often uses aluminium plates. Prints on thick Arches paper. Rolf (Emil Rudolf) Nesch (1893 – 1975) was an expressionist artist, especially noted for his printmaking – ‘material pictures’. He is one of the first artists to have consciously used collage to create collagraph printing plates. Nesch was born in Esslingen am Neckar, and studied at the academy in Dresden from 1912 to 1914. He then participated in World War I, but was taken prisoner by the British. In 1929 he settled in Hamburg to continue his painting career, influenced by expressionism in general, especially Ernst Ludwig Kirchner and Edvard Munch. Upon the Nazi takeover in Germany in 1933, Nesch repatriated to Norway. Inspired by Norwegian scenery and working life, he gave up painting and produced the following year his first so-called material picture, and also took up sculpture. Drawing continued to be a key means of expression. But it is as printmaker that Rolf Nesch made his most significant contribution. As a technical innovator he discovered the potential in new materials – using metal and found objects as the basis for collagraphs. He gave depth and texture to prints by soldering out metal shapes and wire to metal printing plates. He then took this further by drilling holes in plates and sewing to the base plate. The prints were so deep he needed 8 blankets to get the right pressure and very heavy strong paper.Many of his images are narrative with bold use of cutout figures. Nesch died in 1975 in Oslo. The Nesch Museum opened in 1993 in Ål, where he had lived for twenty-five years, to commemorate his hundredth anniversary. Brenda Hartill R E is a British painter, collage artist and printmaker. Her work explores the texture, pattern and light of the landscape, and ranges from finely drawn figurative works to bold, heavily embossed abstract images. Far the past 10 years she has been most interested in drawing abstract imagery from the landscape, rugged mountain erosion, structure of the land and the the dynamics of plant growth. She loves the strong light and shadow of Southern Europe, and remote New Zealand, where she was brought up, as well as the gentler greyness of the light in London and Sussex. Many of her early more figurative works are still available, and are well represented in the portfolio collections here. She is based in her studio near Rye in East Sussex. She is becoming increasingly interested in painting, creating a series of embossed watercolour paintings (see new works), as well as her mixed-media collage paintings using oil paint and encaustic wax . Her recent work includes a series of unique monoprints, in muted colours, and black and white, and there is a strong element of embossing in the latest prints. In addition the three dimensional have always interested her. The more sculptural embossed etchings and collagraphs have led to a breaking away from print on a single piece of paper to mixed media compilations – for example the “floating landscapes”. Sue’s work draws on the landscape of west Somerset. Her imagery sits on the borderline between landscape and abstract. The work is concerned with textures and surfaces and draws inspiration from the lines and patterns found in the landscape that tell stories of formation, growth, erosion and decay. Sue has developed a range of collagraph techniques that allow her to use found organic and recycled materials to create richly-textured prints. She also makes extensive use of chine colle. Many of her images are layered in horizontal strips and represent the seasons and landscape elements. They have a unity of colour and delicacy that I like. Sue received a fine art degree in 2004 from the University for the Creative Arts at Farnham. Since graduating she has combined development of a printmaking practice with teaching in adult education and a career in arts administration. Sue exhibited regularly in galleries and art fairs in London and the South East before moving to Somerset, (where she was born and grew up), in Spring 2011. Share this if you like it.